We have grown quickly over the past six years, and needed a new website to reflect our scalable processes and analysis systems. 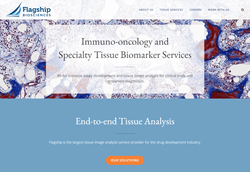 Flagship Biosciences, the largest tissue image analysis provider for the drug development industry, is pleased to announce a website redesign, which highlights our advanced technology and clinical readiness needed to support image analysis based companion diagnostic strategies for the pharmaceutical industry. Flagship’s growth has been accelerated by the adoption of our technology to assist in the creation and interpretation of high complexity IHC assays in the field of immuno-oncology. The new website emphasizes our advanced capabilities and clinical readiness to support image analysis based companion diagnostic strategies in the immuno-oncology field. The website also highlights our 13,000 square foot histology and image analysis laboratory that hosts Flagship’s fast growing quantitative pathology team, with a roster of dedicated pathologists, scientists, and technology experts who all collaborate to meet client objectives. The website can be found at flagshipbio.com.